“A central Otago winery is pioneering a new waste reduction technology. 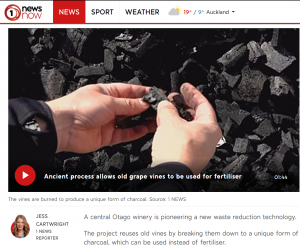 The project reuses old vines by breaking them down to a unique form of charcoal, which can be used instead of fertiliser. These blocks are called biochar, an ancient technology once used by Amazonian Indians to enhance their soil. Now its been adopted by the wine industry for sustainable wine-growing, acting as a fertiliser while also reducing carbon emissions. “Some of the areas that we’re adding to have been mined from the gold miners in the late 1800’s, so those soils are pretty bare. If we can add a lot of nutrients into the soil and a lot of moisture into the soil, the vines are going to do better and it’s going to be better for the soil as well,” says James Dicey from Mt Difficulty Wines. The old vines and other organic waste are burned in a specially made oven for 5 hours, while the temperature and air intake is carefully monitored. This is then cooled down and becomes biochar. 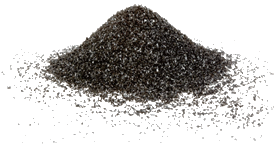 “Once the Biochar’s ready it’s mixed with this compost produced from the vineyards grape waste…then the mixture is spread onto the vines,” says Jess Cartwright from Bannockburn. Mount Difficulty is leading this technology that’s helping our environment, and has just spent $50,000 on the project.